IMX Winners Evan Apuron, Darien Apuron, AJ Lopez, Riley Stewart. USA Swimming held the IM Xtreme Games in Mesa, Arizona at the Kino Aquatic Center Nov. 16-18. To qualify, swimmers in the Western Region of the USA (10 States from New Mexico to Alaska) had to achieve an IMX score of 1500 points or more in the preceding 18 months. An IMX score is obtained when a swimmer swims each of the IMX events. The events include a 200 of each stroke (Butterfly, Backstroke and Breaststroke), the 200 Individual Medley (IM), the 400 IM, and the 500 Freestyle. A score is assigned based on the time for each event and age of the swimmer. The scores from each event are then added together to obtain the IMX Score (similar to the Decathlon in Track). It is a big achievement to complete all the IMX events and a momentous achievement for any swimmer who earns an IMX score of 1500 and qualifies for the IMX Meet. Six Sea Lions swimmers qualified for the meet but due to illness, only four competed. 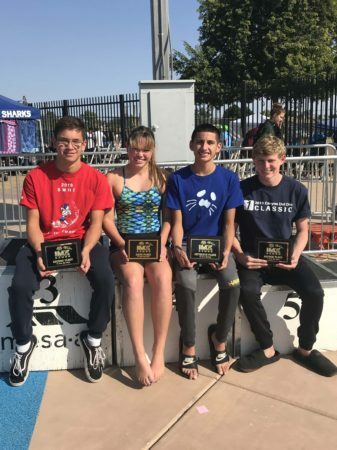 All four of the Sea Lions swimmers achieved top 16 overall finishes in their respective ages and were awarded plaques. AJ Lopez finished in 15th place in the 15 year old Boys Division. Swimming in his second IMX Meet, he showed some real grit in completing all the events even though he was not feeling his best. AJ achieved a score of 2181 and moved up one place from his 16th place finish in 2017. Darien Apuron finished in 6th place with a score of 2161 in the 17 year old Girls Division. Swimming in her fifth IMX meet, this was the third time Darien finished in the top 16 and her 6th place finish matched her 2016 results. Riley Stewart finished in 2nd Place in the 14 year old Boys Division. Riley finished with 4175 points. He had a great weekend of swimming and achieved personal best times in five out the six events. His 200 IM was his highest scoring event. His time of 2:01.54 in the 200 IM earned him 747 points as he finished 2nd in the event. In his fifth year competing at the IMX Meet, and the defending Champion from 2017, Riley put in some outstanding races, but came up just short of repeating as Champion. Evan Apuron finished in 2nd place in the 15 year old Boys Division. Evan finished with 4105 points achieving best times in four out of the six events. Evan won both the 200 Breaststroke (2:12.92 – 754 points) and 200 Butterfly (1:56.86 – 765 points). Evan’s 2nd place finish matched his 2nd place finish from last year. Coach Alex Gort was proud of the results. The Sea Lions Swim Team practices in Oro Valley during November – March while the water is too cold to hold practice in Mammoth. Anyone interested in more information on the Sea Lions can contact Alex Gort (896-2190) or check the team website, sealionsswimteam.com.